We got a late start to the Arthas event (totally on me, had to tend to my six month old son for a bit so thanks everyone for your patience!). But in the end, we dropped lots'o'gold! I think about 83,000 in total, though I'll rely on Noelani's numbers. 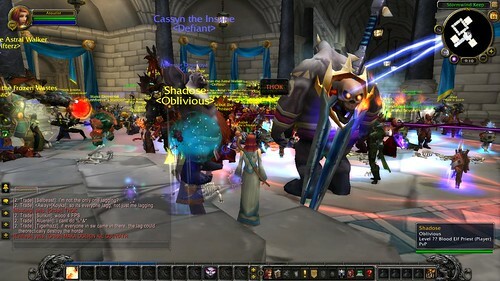 I missed all the chaos that preceded the event with a Horde raid that was apparently made up of about 5-7 unique raids that all hit Stormwind Keep simultaneously! I'm sure we'll see some great picks and links to videos soon and hopefully they'll share them here with us! I had been planning on livestreaming the event but with my late arrival I wasn't as prepared as I'd hoped but Elvinelol picked up the slack and streamed it from his site twitch.tv/elvinelol. Check it out, the show is up on his page and you can catch the commentary from the judges beginning around 50:00 when the show kicked off. More to come on this show, just wanted to get the thread opened! Well they say a picture is a thousand words. This is what I walked into when I entered Stormwind Keep. I figured I want to help host one of these shows, I should watch one in action. My journey started yesterday when I decided to enter Arthas. I created a level 1 priest named Noemin, got her to Stormwind Keep and then realized it was too similar to my liking to Noelani, so I deleted her and created another priest this time appropriately named Atourist. As someone who has yet to play Alliance it was nice to be able to check out Stormwind. I logged back in at 6:00 my time on the dot to the scene in the picture. I was surprised at how quickly the invaders got bored (though the lag was absolutely horrid) and they were pretty much all gone by 6:30/9:30. The contest started about ten minutes after that. There were some unimaginative hecklers who couldn't come up with any other insults than gay. Yeah, as a bisexual female who collects dolls you're going to have to try harder than that. It just makes me think you're insecure about your own manhood. The actual competition was quiet and what I expected in game. After a while I put the livestream on as well and it greatly enhanced the show. I was great to be able to keep track who you were talking about as well as get a look at the entire room. I was impressed with a lot of the outfits. Such thought to detail! I look forward to seeing more pictures and reviewing the commentary. I had a great time and look forward to checking out Lightbringer. I hope to get the funding for Skywall soon. I had a blast helping out with the show. 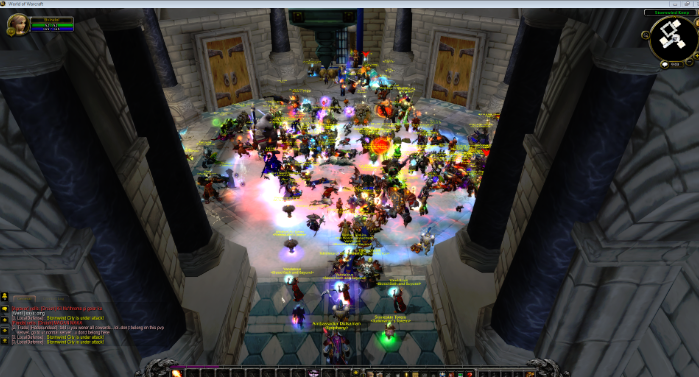 You can check out the Pre show PvP Horde raid on Stormwind and also the show with its commentary at the following link.. http://www.twitch.tv/elvinemod/b/311905359 - As Keelhaul stated the show starts around 50:00. Didn't know if we were gonna relocate due to the amount of Horde, but Alliance finally pushed them back! WoW Roleplay Gear has their writeup available now on their blog - fantastic!